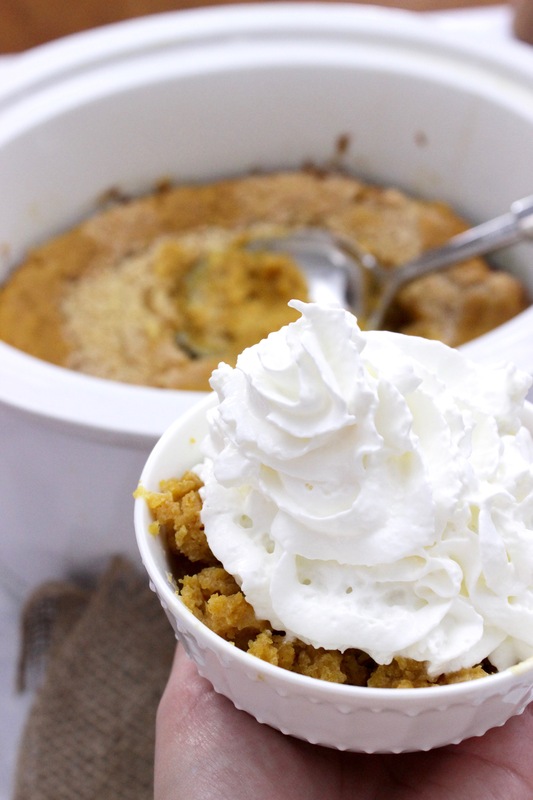 This Slow Cooker Pumpkin Dump Cake is the best! Want a pumpkin dump cake without heating up the kitchen? This is the pumpkin dessert recipe for you! Fall is just around the corner and I can’t wait. Me+ Plaid+ Leggings+ Cardigans = True Love and nothing short of it! Our darling son adores pumpkin food everything. Pumpkin bars, pumpkin pie, pumpkin crumbles, everything pumpkin. So naturally, he’s my favorite. Totally kidding. Our daughter is the apple of my eye just the same. Love them both to pieces. I knew it was time for me to get back in the kitchen and whip up a little something pumpkin dessert -ish. 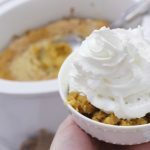 And, because Mom’s craving a serious dose of extra time on her hands and less time in the kitchen, this turned into a pumpkin crock pot dessert. Because, well, everything is better when it has the words crockpot dessert in it, isn’t it? I think so! So, I have to say that you’d be much better off using a crock pot like this one for desserts like this. A friend had just mentioned that she made another dessert of mine in her 4 quart crock pot and it burned. The stoneware crocks tend to do that. It’s like they have a shot spot in them or something? Not sure, but this one here is my absolute favorite crock pot of all time. It’s pricey, but right now it’s marked down a little bit, but I imagine only for a short while. Back to this crock pot dump cake that I’m raving about, right? So, this cooks up a bit weak in the texture. It’s not “pumpkin cake” but it’s certainly not “pumpkin pie filling” either. It’s a mixture of both and it’s heavenly. If you like that sort of in between thing. 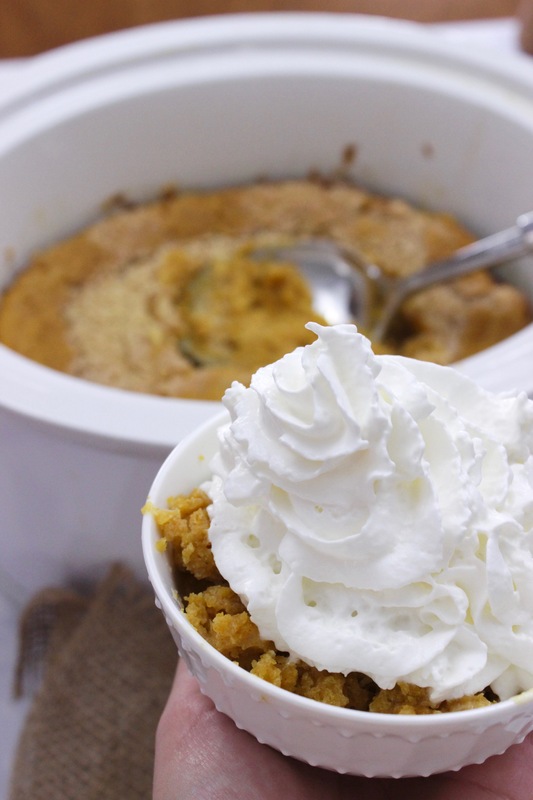 And I would highly recommend having some whipped cream to go with this slow cooker pumpkin dessert. It’ll make the while experience way better because, well… when does whipped cream not make any situation better? Ha! Too funny! On to the recipe.. you guys, this one is so incredibly easy. Like silly easy. And, it cooks in about two hours, so it’s one that you can dump in before dinner, enjoy some conversation and then come back when everyone needs a sweet ending to the meal. First, grab your yellow cake mix. 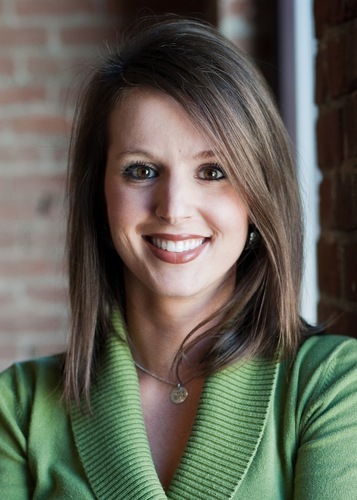 I chose Betty Crocker, because who doesn’t love Betty? prepare the cake mix. Add in one cup of pumpkin, and 1 teaspoon of pumpkin pie spice. Spray your crock pot with non-stick spray, or you could use a liner instead. Totally personal preference. Pour your prepared cake mix in the slow cooker. Add dollops of cream cheese frosting on the top of the cake mix and swirl, swirl, swirl to your hearts content. This is going to make the cake a bit more moist and absolutely delicious. Put the lid on the crock pot, set to high and check it at a little over an hour and a a half, and again every 15 minutes from there. I warn you though, just lift the lid a tiny bit, you don’t want to let all of the steam out. Use a butter knife to poke in the middle. When very little sticks to the knife, you’re good to go with this fantastic pumpkin pie cake of sorts. 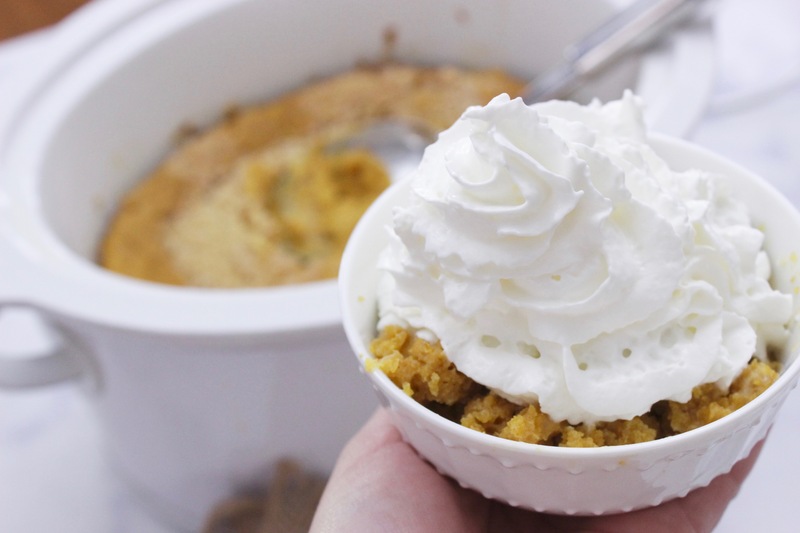 And, finally, top this slow cooker pumpkin dump cake with some whipped cream – if you’d rather go homemade, try this homemade perfect whipped cream recipe. It looks absolutely delicious! ** If you really, really love the flavors of fall you could use the Betty Crocker Super Moist Spice Cake Mix, so instead of making this a pumpkin dump cake yellow cake, it would be a pumpkin dump cake spice cake. Get it!? Everyone’s a comedian on a Friday! I hope you enjoyed this – please, if you decide to try this will you let me know what you thought of it in the comments? That would be so awesome! Top with dollops of cream cheese frosting and stir around a little, careful not to push it to the bottom of the cake mix though. You just want to swirl it. Serve in a bowl topped with whipped cream – ENJOY! 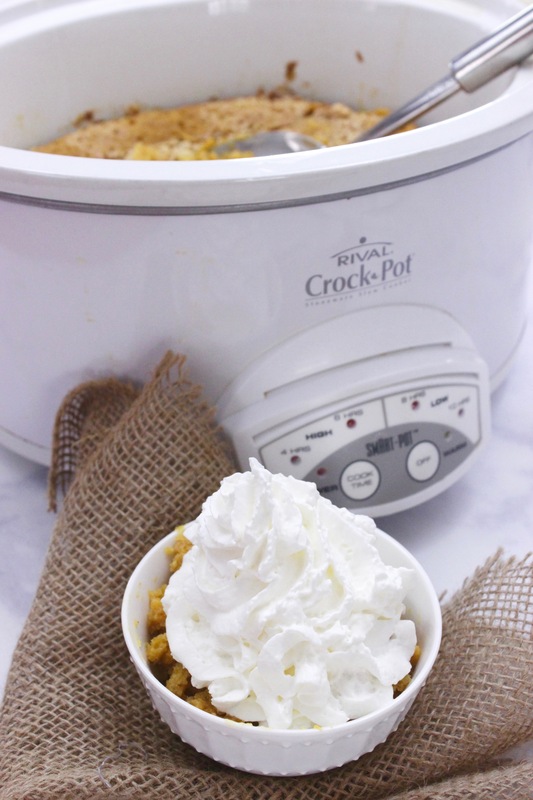 This crock pot dump cake is easy, delicious and complete Heaven topped with whipped cream. Since you place everything in the slow cooker, it bakes on its own, too! Make this pumpkin dump cake recipe now, you won't regret it! Serve in a bowl topped with whipped cream - ENJOY! Be careful not to burn, check it every 15 minutes after 1 1/2 hours!